Share with Friends and Earn Party Crowd Rewards! Party Bucks, Party Crowd Apparels, Party Crowd Tickets and more! Show us some love, share us with friends and family and earn amazing Party Crowd rewards like Party Bucks, Crowd apparels, Crowd Tickets and more! Share with friends, and earn great rewards, EVERY DAY! It's FREE; only 3 easy steps! 1. Join the Crowd, get your Crowd Link & earn $ 5 now! 2.Share your Crowd Link with friends everywhere! Post and share it on Facebook, Twitter, Email, anywhere! 3.Watch your rewards grow, grow, grow! When friends click your Crowd Link, join or buy tickets, you earn sweet party rewards like free Party Tickets, Crowd apparels & more! Share your Crowd Link with friends everywhere, and earn $ 0.01 Party Bucks every time friends click on it. Share your Crowd Link on Facebook, Twitter, via Email, anywhere! Party Bucks earned for clicks are automatically calculated and paid to your account every month on the 1st of the Month. 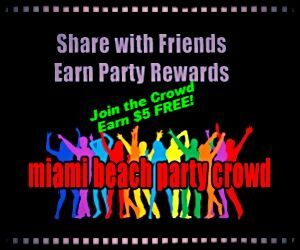 Post a comment on miamibeachpartycrowd.com and earn $ 0.05 Party Bucks! No limit, earn every time you engage and share a thought! Earn $ 0.50 Party Bucks every time a friend joins the Crowd. Absolutely no limits, earn every time a friend parties with the Crowd! Earn $ 1.00 Party Bucks when friends purchase anything ( including Party Tickets, and Crowd Apparels )! Help a friend have a time of their lives and earn! Talk about win-win-win! Earn $ 0.50 Party Bucks Cash Back when you make a purchase. Earn $ 1.25 Party Bucks when you complete a poll. 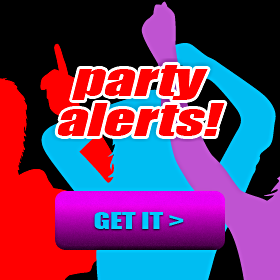 Earn $ 5.00 Party Bucks just for joining the Crowd! Earn $ 5.00 Party Bucks when you complete a survey. Need more details? Here's Party Crowd Rewards 101! Want web banners? We got you covered!